Petroglyphs - Geoglyphs - Colorado River - Needles, Ca. 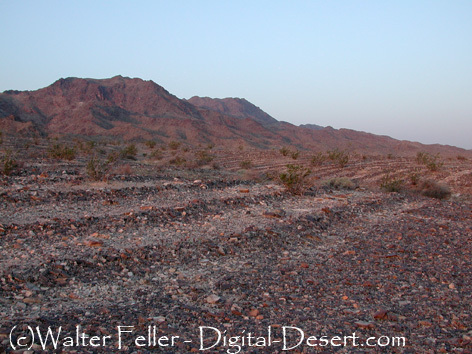 This is the Topock Maze; indeed, a cultural site of much importance to the tribe. To this site the Aha Makav warriors returning home from battle first paused for purification before continuing home." Not a true maze, this site is a series of windrows carefully placed in an extensive geometric pattern. Today, the site covers about 10 acres. Evidence suggests that it may have originally been only one section in a group of nearby earth images and features. Sadly, important parts of the complex were destroyed by the construction of the highway. 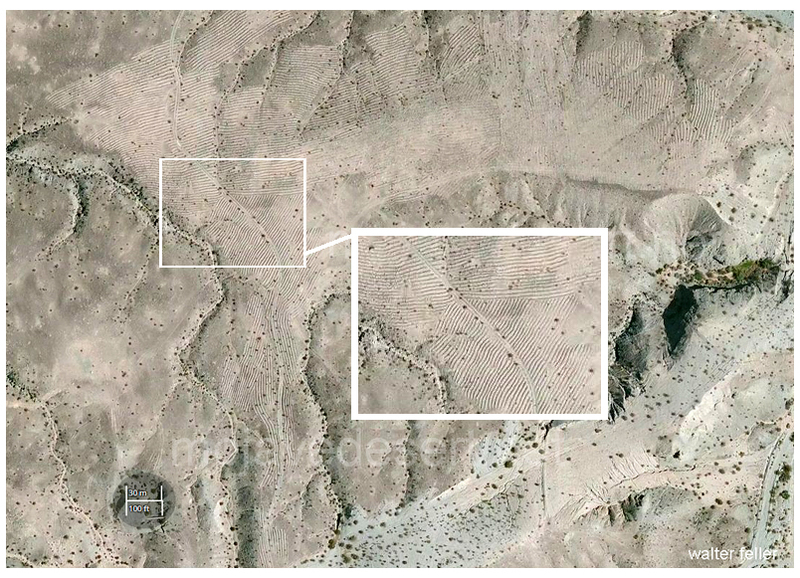 But whether or not the geoglyphs in this vicinity were associated with one another, this was clearly an area of symbolic and ritual significance. This is the Mystic Maze or Topock Maze (D.G. Thompson, 1929:517 and plate 30; Haenszel, 1978). “The maze has always been here” are key words to remember when viewing the maze. The river narrows were first called Red Rock (after the red upper plate Miocene sediments), then named Mellen (Mendenhall, 1909) after a river boat captain, and finally Topock (Thompson, 1921). The Topock Maze consists of three components. A curvilinear 100´ x 60´ anthropomorphic figure was destroyed by construction of the California Southern/Atlantic and Pacific/Santa Fe Red Rock cantilever bridge in 1888 (Myrick, 1963) during rip-rap collection for berm and roadbed for tracks laid in 1893. A curvilinear “eye” figure (from “hook and eye”) remains intact. The other component of the maze consists of parallel gravel windrows . Dark vanished desert pavement on terrace lobes is covered with windrows that stop before the margin of the terrace and rarely cover all of the terrace surface area. These geometric rectilinear windrows are referred to as the “maze,” but the ends of windrows are not closed except where they approach other windrows. The rows do not follow contours, but transgress slopes and surfaces (Haenszel, 1978). Another “maze” occurs at Topock on the Arizona side of the river. “In 1932 I flew over…the maze…on the California side…and a smaller maze on the Arizona side near the railroad bridge. The latter had been made by scrapers when the bridge was built…” (Woodward, p. 28 in Haenszel, 1978). 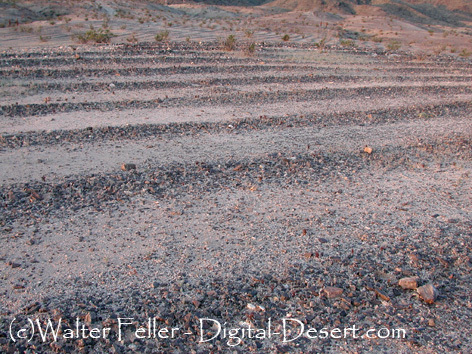 Both curvilinear figures associated with the Mystic Maze are similar to other ground figures on terraces along the lower Colorado River. However, no other examples of parallel windrows of proven aboriginal origin are known (Haenszel, 1978). The use of Mohave Indian labor to scrape desert pavement gravel into rows to be collected for construction of bridge abutments, berms, and road grade is well documented (Haenszel, 1978). 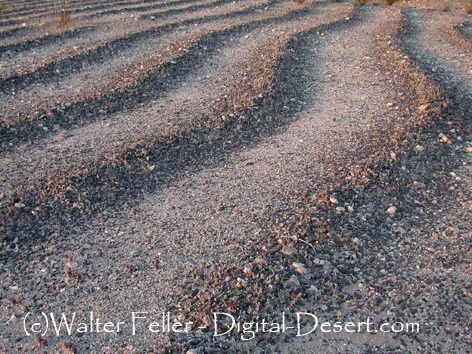 Interviews with Mohave Indians indicate that the maze (windrows) was not used by the Mohave tribe, but was made by the “Old Ones” (Thompson, 1929; Haenszel, 1978). 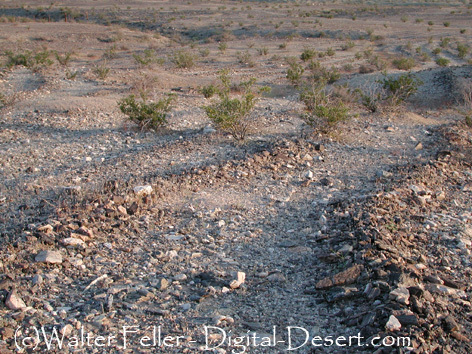 Haenszel (1978) notes that windrows were probably made by scraping or raking desert pavement. However, she presents documentation from observers that the maze was present in 1886, prior to construction of the Red Rock cantilever bridge. Haenszel relies heavily on Mohave statements that the maze was in place prior to their arrival (A. D. 1200), although used for religious purposes by the Mohaves. Questions arise: Were the Mohaves referring to the intaglios or to the windrows? The windrows avoid the curvilinear figures. Did Mohave laborers avoid the intaglios for religious reasons? Amassing gravel in windrows over 18 acres involves a great deal of effort. Who paid for this labor and why was the gravel not collected or used? Historic photographs (Pl. 30-B, Thompson, 1929; photos from 1897, 1922, 1931 in Haenszel, 1978) show gravel rows as steep-sided ridges. Today, they are deflated to low, rounded rows. If rows were steep-walled in 1897 and almost flat in 2007, this author (RER) suggests that the rate of deflation is finite, and doesn’t allow for construction of windrows prior to the mid nineteenth century. Read the archaeological description by the Mohave Nation mounted at the viewpoint. Examine the low, parallel gravel rows . Look for black desert varnish (upper surface) and red oxide (under surface) that indicate the cobbles were disturbed.